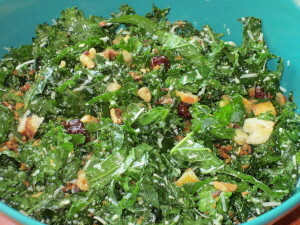 One of the items on my camping menu was my new salad obsession, a Kale Salad with Pecorino and Walnut from Smitten Kitchen. Oh, man. I love it so! Even though I’m only doing a half-share with the CSA this year, I’ve been getting tons of greens (this week a bunch of kale, bok choy, and chard, and that’s a light week), and no one else in the family loves greens. Until recently, I had only one kale recipe that I really enjoy: Mark Bittman’s Grilled Coconut Kale. The problem is, I’m the only one who eats it, so the virtue of eating all of that kale is mitigated by the fact that, in the process, I basically eat a full can of coconut milk. (And yes, I’ve tried kale chips. Don’t love ’em. M will eat them, all the while complaining that she doesn’t like them.) The point is, the grilled coconut kale was getting old. So hooray for the new salad! You cut the kale into ribbons, which addresses that kale-is-tough problem (the other night Cute W called to me, “Honey? Someone on Facebook says we need to massage our kale. . . ” and I’ve actually been massaging it a bit, too). What’s even more awesome, for me, is that I can eat the leftover salad. You know how, once you put dressing on a basic lettuce salad, you really can’t save it for later, because it’s gross? Kale, like cabbage, can stand up to the dressing enough that you can store it and pull it back out. So, for our camping trip, I mixed up the kale, dressing, and grated cheese and put it all into a big baggy, and then when we were ready to eat (because, oh, glorious salad! Cute W eats it, too! ), we threw on the other items in single portions. I ditched golden raisins in white wine vinegar in favor of dried cherries in balsamic vinegar. Also, I rediscovered homemade croutons. For years I blew off croutons entirely, because isn’t the whole point of a salad that you are eating stuff that’s good for you? But I went ahead and toasted up the leftover bread that was just getting stale and judging me from the counter, and I realized how very foolish I’d been. Because homemade croutons use blechy stuff that no one wants (like the ends of the bread) and makes something so . . . so very. . . beautiful. I’m sorry: I’m getting a little weepy. Anyway, you should try it. It is awesome. Meanwhile, my kids are obsessed with good ol’ homemade juice pops. I don’t quite understand it, actually. A couple of times this summer I bought various ice pops, and I’d always end up with one or two that no one would eat, and then the Popsicles would sit in the freezer, taking up space and judging me (Jeez! Does anyone else have totally judgmental food all over their kitchen? And also papers all over your desk? What the hell is that? 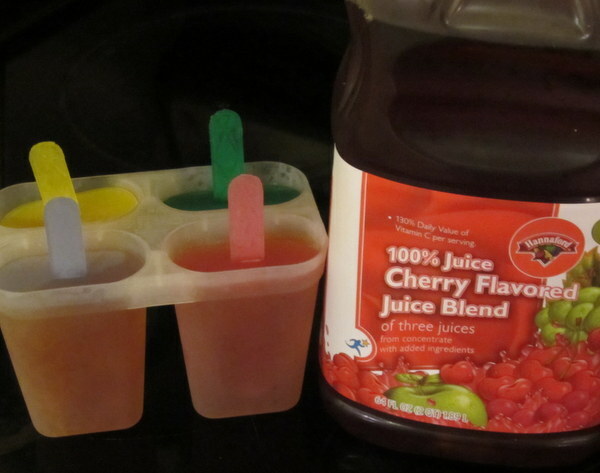 ), and then the pops would get gooey and sticky and I hate to waste, so I’d end up throwing them into a smoothie (thereby marring the smoothie’s perfection) or handing out the treats to random children who were choosy than my own kids. Then I finally wised up. They love the homemade ice pops. I don’t understand why, but they will eat them as quickly as I manage to make them. And that’s after I scrounged in the back of our cabinet and found three different pop molds (our favorite are the round ones, which are easier to extract). Plus, if and when they lose interest, the juice is my go-to juice for smoothies, so that works out great. And speaking of juice, I’ve been going through lemon and lime juice like nobody’s business lately. The Poland Spring Sparkling Water with some lime juice is my better-for-me-than-Coke-Zero beverage, and I might, might, almost be liking it as much as actual Coke Zero. So that’s an exciting milestone. 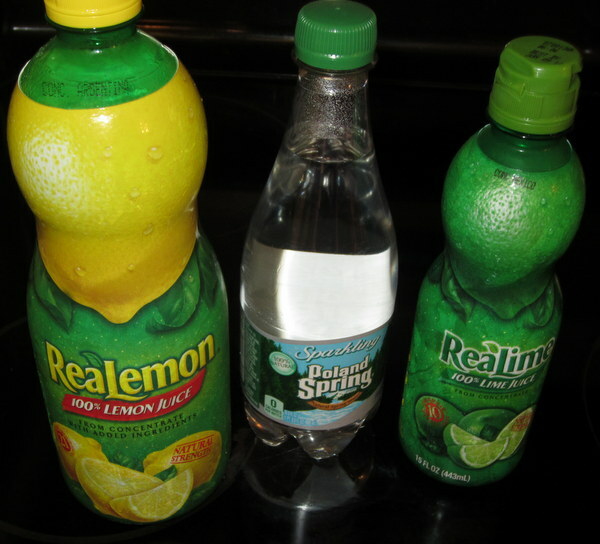 We’ve also been doing a lot of lemonade with a bit of Stevia and a bit of Agave. Too much of either one doesn’t work, but a little of each is awe-some.